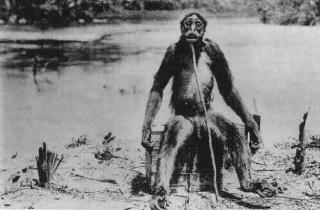 This photograph is the only one available of Loys's "Ape," taken after the primate was shot in 1920 by Swiss geologist François de Loys and his party in the Amazon forests of Venezuela. In 1917, François De Loys, a Swiss geologist, set off on an expedition into the montane and lowland rain forests of Venezuela. His expedition lasted for three years, and encountered many difficulties, including sickness and hostile Indians. Only a few expedition members survived. The expedition's cook prepared and preserved the animal's skull, and put it into a salt box. It later dried and disintegrated in the heat, and little by little the pieces were lost forever; but the photograph has remained. It was reported that the monkey was almost 5 feet, 2 inches (157 cm) tall, and a new discovery for science. It appeared to be a tailless primate, with the arms longer than the legs, and it had a flattened chest. The primate became known as Loys's Ape, although, of course, apes are only found in the Old World. Only monkeys are found in the New World Neotropics. This account was given in detail by Bernard Heuvelmans in his classic book, On the Track of Unknown Animals (Hill and Wang, New York, 1958). Since then, many have speculated about the possibility of Loys's monkey-as we will call it here--still existing in the Venezuelan rain forests. The most recent reports were made in the 1970's. However, stories have recently been spreading in the Venezuelan forests about encounters with this primate. 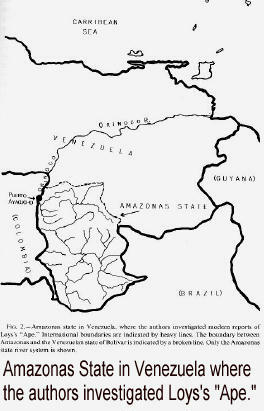 After studying the history of these reports, we decided that the Ventuari and Orinoco Rivers, in the state of Amazonas, were the most likely places for present-day encounters. In October, 1990, the authors and three others, Bill Cacciolfi, Leon Childers, and Ken Wohlers, undertook an expedition to this area. After meeting in Caracas, we proceeded by bush plane to the state of Amazonas. We landed near the Ventuari River, and were met by Piaroas Indians and Lorenzo Rodriguez, a well-known jungle pilot for over 25 years. The expedition spent a great deal of time traveling a wide variety of rivers in this area, interviewing Indian villagers, and showing a variety of pictures of Loys's monkey in comparison to the African gorilla, and the American Sasquatch (Bigfoot). We embarked on a long journey up the Ventuari River and related tributaries. There we interviewed an older jaguar hunter who was a good friend of Rodriquez. When inquiring in regard to the giant monkey, he replied that, as a boy, he had captured such a monkey. It was over 3 feet (91 em) tall, and he had placed it in a cage and sent it to Puerto Ayacucho. He did not hear any more about this animal. Several days later, while on the fiver, Khryztian (Marc Miller's daughter) became ill from heat stroke, and we had to rely upon a nearby village and our own travel medicines to restore her to a level at which we could carry on with the expedition. We then arrived at the Cabadc Las Piedras Waterfalls, and spent time in a local Indian village. The inhabitants stated that, within the past year, four of them had been on the Ventuari River and had heard the cry of the giant monkey nearby. They became frightened and ran back to the village. Another of the Indians reported that he had seen giant monkey tracks, and had followed them; he said he saw a giant monkey grab a fish from the river, take its head off, and eat the fish. He tried to shoot it, but he panicked and ran. He stated that this happened a number of years ago. Further inquiry suggested that, around 1980, two daughters of a nearby villager saw a giant monkey on the Orinoco River. This was at the village of Arrandagao. Our stop at a village called Moro Coto also proved to be fruitful. Here the Indian hunters knew of this large monkey, and they said it runs in the mountains. They stated that they had found its tracks and heard its call many times. They call this large monkey salvaje, and say it cries and yells like a human, but has no language. They stated that it has not attacked people for many years. During our evening campfire talks with Rodriguez, he told us about some of the many legends and stories of the jungle. The Indians talk of a giant anteater that will stand up to a jaguar, fighting with its claws. One of the Indians told us that he had seen a large animal--larger than a tapir--with large lips. Finally, Rodriguez told us that he himself had found footprints of the giant monkey on his airstrip about two years before. The prints were turned inwards and he estimated the animal weighed 80 to 100 pounds (3645 kg). The Indians had followed the tracks into the mountains. A hunter also came forth and told us that, approximately 10 years before, he had been sleeping in his boat on the Ventauri River, close to a village, when the giant monkey came down to the boat. This was at the village of Laja Pelada. There the monkey was known to sometimes come down from the mountains. The Indians do not kill the giant monkey, as they are fearful that it may have spiritual powers. Rodriguez told us that in 1989 he had shot an anaconda snake over 21 feet (6.4 m) long. It had tried to attack two small Indian children in a river. He emphasized how the rivers hold many unknown species, and that the forests are full of legends. The next morning, Rodriguez showed us the exact spot on the landing strip where he had found the tracks of the giant monkey. He stated it was easy to follow the tracks, as they were imbedded in the sand of the airstrip. Our expedition then flew to Puerto Ayacucho, a small town onthe Orinoco River, where we planned to investigate further reports of the giant monkey. There we met with Oswaldo Calderson, whose mother had lived on the Casicalo River. She reported to us that she had seen the giant monkey over 25 years before. She told us of another local informant named Fernando Nives. He told us that he had seen the giant monkey 10 years before while hunting 25 miles (40 km) north of Puerto Ayacucho. He described a very strong odor as he came closer to the animal. He took his boat off to the side of the river, and saw three large monkeys standing over 5 feet (152 cm) tall. He described the animals as reddish-colored. Another incident was relayed to us by a local resident: 15 years before, while using a bulldozer to clear an area for a road, the engine had stopped and he could hear the call of a monkey. He later saw it, and also described it as having reddish hair and standing over 5 feet (152 cm) tall. Khryztian, who speaks fluent Spanish, was able to accurately interpret the information being relayed to us. The following day, we went by boat up the Orinoco River, which serves as a border between Colombia and Venezuela. The Orinoco has over 1,000 tributaries. Huge granite mountains rose throughout the area. We stayed at an Indian village, and the chief shared many stories with us, speaking in broken Spanish. The chief told us that only a few months before, while hunting with his blow gun, he had seen a giant monkey. He described it as having reddish hair, and that it stood as tall as himself; this would be approximately 5 feet (152 cm). He told us that he had shot the giant monkey, but did not take it back to the village as he was fearful it would be a bad omen. The area is quite remote, and we introduced the village children to ice; it was very interesting to observe their reaction. The chief of the village had lost his left leg because of a snake bite, and now used a prosthetic device that he carved from wood. The tributary where the giant monkey had been killed is called the Baruasa River. We stayed with the Bendare Indians in the area, and offered them a handsome reward if they could find the skeletal remains of this giant monkey which the chief had told us he had killed. Zoologists will find it difficult to reach any conclusions from this expedition report. However, we believe that there is a high probability that some form of large, unknown monkey, from 3 to 5 feet (91-152 cm) tall, has been heard and seen by many Indian villagers and townspeople; and tracks have been reported by reliable sources, such as Lorenzo Rodriguez. All of the reports appear to contain the same description: a large monkey, somewhat thin in stature, with long arms, and having reddish hair. It is our opinion that there are a wide variety of primates that have been labeled salvaje, didi, and a number of other names. Such reports have been made as far north as Central America, where some carvings by Mayan Indians have primate-like features. Due to the almost impenetrable terrain and the vastness of the Venezuelan forest, further attempts to find Loys's "ape" or giant monkey (mono grande) would be very difficult. It is likely that there are a limited number of these large primates living in that part of South America. While rare, there are too many sighting reports from a wide variety of sources to discount this primate as myth only. The Millers had no immediqte plans to conduct further fieldwork in this area.